When I was on vacation in Japan, I took time to watch a Japanese wrestling sport, Sumo; I watched something interesting and become an idea of this article. At the one session, there was an entertainment session that performs a real sumo wrestler against a little boy. It was so funny saw their body size that totally incomparable. “A little boy facing the giant” said my husband laughingly. I saw that little boy was trying hard to push 382 pound weight the sumo wrestler and finally the real wrestler falls and lifted his two hand up as a sign he give up and lose. What I saw an impossible thing yet very funny and entertaining. But, in other side it was made me thinking. I am thinking about our lives. In our daily lives, we often like that little boy. 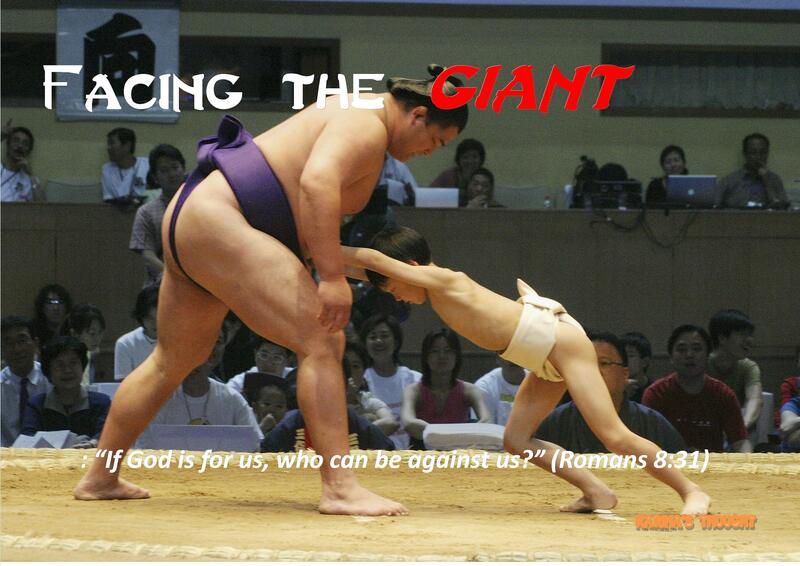 We often are facing “The Giant”. Not the real giant but one thing that couldn’t be separated from every aspect of our lives. “Problem” There’s time we face a big problem as though we face a giant and we are like the little boy that too small compared with the sumo wrestler. Often time we aren’t just facing one problem but we have to face a huge of problems that come at the same time and seem impossible to overcome. Even worse, in my personal experience the problems seemed compete who the first that successfully beat me. When we talk about facing the giant, I’m very sure we will reminded about the story of David against Goliath. David, a very young shepherd was facing a six cubits champion complete with bronze helmet, bronze greaves on his legs; a bronze javelin slung on his back, armed by spear with six hundred weighed on its iron point. We all also know the ending of this story. David won against Goliath only by a sling and one stone. There are two interesting point could be a lesson for us when we are facing “the giant” Let’s take a look at verse 37 of 1 Samuel 17. David said to Saul: “The Lord who rescued me from the paw of the lion and the paw of the bear will rescue me from the hand of this Philistine.” Well, you know, this’s about David’s intense belief to God. He strongly believes if God has rescued him from the beast, God will also save him from Goliath. Now let’s go to the verse 45. David said to the Philistine, “You come against me with sword and spear and javelin, but I come against you in the name of the Lord Almighty, the God of the armies of Israel, whom you have defied” It’s about relying on God. I’m pretty sure at the time David, with his background as a shepherd, aware of their ability to fight. He also totally realized Goliath wasn’t a balanced opponent. But David didn’t afraid at all because he was in God’s protection and didn’t rely on his own strength but he totally relies on the Lord almighty. Now, I will take all of us to look the last story. Let’s have a look to the story of Jehoshaphat in 2 Chronicles 20. Jehoshaphat feared when he knew that a vast army of Moabites, Ammonites, and some of the Meunites will come against him from Edom. It wasn’t an easy situation. Because the power of Jehoshaphat and his people wasn’t enough to face the great multitude But Jehoshaphat made a right decision. He seeks God! He knows to whom he rely on. Then finally God said to him: ‘Do not be afraid nor dismayed because of this great multitude, for the battle is not yours, but God’s.” (2 Chronicles 20: 15) And God also said in the verse 17: “…stand still and see the salvation of the Lord, who is with you, O Judah and Jerusalem!’ Do not fear or be dismayed; tomorrow go out against them, for the Lord is with you.” The end of the story is Jehoshaphat and his people rejoice over the enemies. Yes we don’t have to be afraid because He goes with us together with His angel that will go ahead of us. My beloved friends, we may not know what kind of “giant” that we must face. We may not know how strong the problems that will attack us. But once again I encourage all of us to always believe, stand still, don’t be afraid, and don’t give up. We are not alone. We have God who always with us. “If God is for us, who can be against us?”(Romans 8:31) Amen.